In the latest Mount Baldy observing report I described an awesome predawn conjunction of the moon, Venus, Jupiter, and the bright star Aldebaran. What made it so great was not just the close appearance of four bright objects in the eastern sky, but the almost perfect symmetry of their arrangement: not only did they form an almost perfect arrowhead shape, but the arrowhead pointed straight up toward the Pleiades. All in all, just about the most beautiful celestial sight I’ve seen with my naked eyes. Just as the kite was flying up over the hill to the east of our observing site, a nice couple drove up and set up a camera. They were Robert and Elizabeth Preston, and they kindly send this photo with permission to post. Trust me, you’re going to want to click through to the big version. 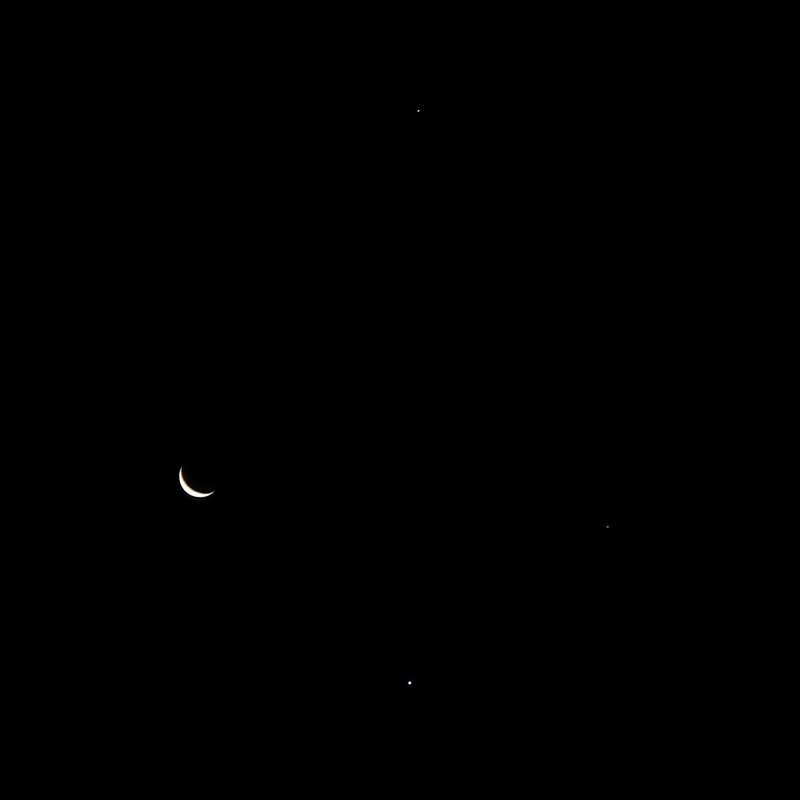 Here’s a closeup of the four conjunction objects from a photo by Terry Nakazono. The moon, Jupiter (top), and Venus (bottom) are all unmodified. I had to crop out the area around Aldebaran (right) and boost the contrast to bring out the star. I can’t imagine a better end to an observing run. Whew! Last night rocked. Terry Nakazono was out from LA, and we had been planning for about two weeks to spend the night observing up on Mount Baldy. We had made a shorter, half-night run up the mountain back in June, Terry to chase faint galaxies with his SkyScanner and me to log a few Herschel 400 objects with the XT10. Last night was basically the same plan, but on steroids–the moon was rising later, and neither of us had anywhere to be today. My wife and son were both out of town, she on work and he on a sleepover, so I was released on my own recognizance. 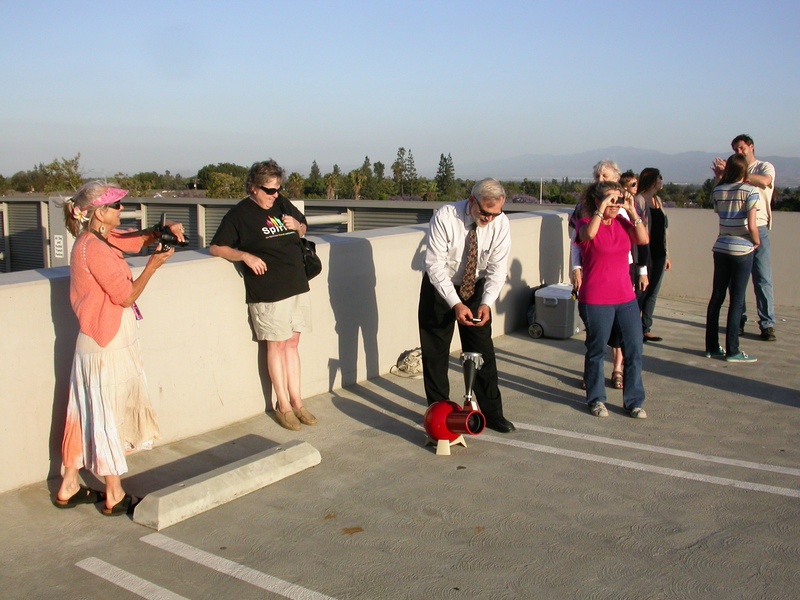 We got up there about 8:45 and met fellow PVAA member Craig Matthews setting up his 8″ Dob. Former PVAA president Ron Hoekwater joined us a little later on. Terry was rolling with his SkyScanner again, and aiming for galaxies in Ursa Major and Bootes. I decided to leave the XT10 at home and take the Apex 127 Mak instead. I’ve had that scope for about a year, but before last night I had not really tried it out under dark skies. It did go to the Salton Sea in February, but we were mostly clouded out that night. Five inches is a lot of aperture under dark skies, and I was anxious to see what the Mak could do. Mount Baldy is not stupid-dark like Afton Canyon or western Arizona, but it’s not bad at all. The Milky Way was prominent and showed a fair amount of detail, especially after midnight when a strong marine layer at lower altitudes effectively halved the light pollution to the south (Inland Empire) and southwest (Los Angeles). On light pollution maps Baldy shows as being in the Orange zone, Bortle Class 5, but between the altitude and the marine layer it is sometimes effectively Green (Bortle 4). Last night was such a night. I also took along the Celestron Travel Scope 70, which I had otherwise only used for quick peeks from my driveway. I’ve been meaning to blog about that scope. Right now you can get the scope, finder, two eyepieces, a tripod, and a backpack carrying case from Amazon for about $70 shipped. The finder is a travesty–an all-plastic “5×20” unit that is in fact stopped down to 10mm right behind the objective. I stripped the so-called optics out of mine and use it as a naked-eye sight tube, in which role it performs admirably, and a heck of a lot better than it ever did as a magnifying finder. 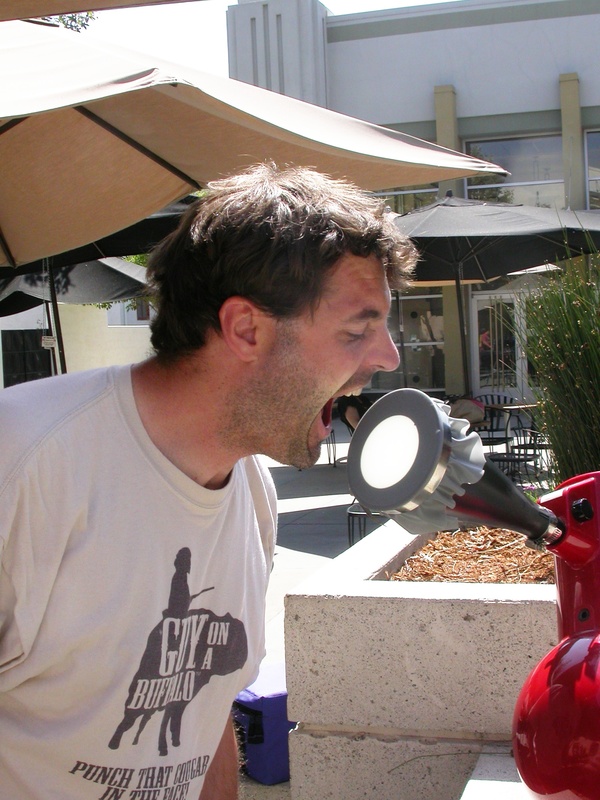 The tripod is a joke, the sort of thing that gives other flimsy tripods a bad name. It struggles to hold a point-and-shoot digital camera steady, let alone a telescope, so I donated it to a museum. But the eyepieces are serviceable, the carry bag is fine, and the telescope itself is okay–more on this in the next post–so for $70 it is a screaming deal. As with the Apex 127, I was anxious to see what it could do under dark skies. It was not yet fully dark when we arrived so I spent some time jawing with Craig. It was cloudless and clear where we were, but we could tell it was raining in the Mojave Desert, because the northeastern sky flickered with distant lightning. And we knew it was far off because we never heard even a hint of thunder. The lightning was not reflecting off clouds but off of the sky itself. It was as if the sky was on the fritz, like a bad florescent bulb. It was a profoundly weird and unearthly effect. I started my observing run by putting the Apex 127 on Saturn. In addition to observing with “new” scopes, I was also rolling with genuinely new eyepieces. Explore Scientific has been having a CUH-RAY-ZEE sale on their well-reviewed 68, 82, and 100-degree eyepieces, so I sold some unused gear and bought a few: the 24mm ES68, which delivers the widest possible true field in a 1.25″ eyepiece, and the 14mm and 8.8mm ES82s. The Apex 127 is my longest focal length scope at 1540mm, so those eyepieces yielded 64x (24mm), 110x (14mm), and 175x (8.8mm). I also have a 6mm Orion Expanse that gives 257x–that is my default high-mag eyepiece in any scope. The ES eyepieces had just arrived in the mail last week so last night was my first time to try them out. Anyway, the seeing was limiting, with the view shaky at 175x and downright ugly at 257x, but Saturn was crisp and jewel-like at 110x and I could see four moons even at 64x. I haven’t checked the charts to see for sure which ones they were, but Titan certainly, and Dione, Rhea, and Tethys probably. I have seen up to five moons of Saturn at once before, but that requires steadier skies than we had last night. After Saturn I hit a few favorite Messiers, including the globs M13, M5, and M4, all of which were impressively resolved for a 5″ scope. My favorite view of the evening through the Apex 127 was of the galaxies M81/M82 in the same field at 64x, with tantalizing hints of detail visible in both. Then I got to work, finding and logging Herschel 400 objects. I was chasing mostly open clusters in Cygnus and Cassiopeia. I logged NGCs 6866, 7062, 7086, 7128, 7008 (a planetary nebula) and 7790. I also tried for open clusters NGC 7044 in Cygnus and 136 in Cassiopeia, but could not locate anything I felt comfortable calling a definitive open cluster at the charted locations amid the rich Milky Way starfields. This was also an issue with several of the Cygnus clusters I did log—at high magnification they tended to disappear into the surrounding star chains and asterisms. Getting skunked is no fun, and by that time I’d been working on H400s for about two hours. For a change of pace, I switched over to the Travel Scope 70 and started plinking at Messiers. With a 32mm Plossl eyepiece I got 12.5x magnification and a stunning 4-degree true field–more like a finder on steroids than a telescope. I started with the Double Cluster as soon as I saw it was over the horizon, then hit M31, but didn’t immediately see its satellite galaxies. Then it was on to the “steam” rising from the teapot of Sagittarius: M8, M20, M22, M24, M25, M23, M18, M17, M16—these last three all nicely framed in the same field—M26, and M11 up in Scutum. Then back to the “bottom” of Scorpio and Sagittarius to catch M6 (M7 had already set behind a hill to the south—bummer), M69, M70, and M54, then all across the sky for M51, M101, M102, M13, M92, M15, back to Andromeda for a nice view of M31, M32, and M110 all prominent in the same field, M52, M103, M33, M76, and M34. I’d seen all these things before, but for most of them this was the lowest magnification I had seen them at, given that my binocular observations of them had mostly been with 15x70s. One of my favorite views of the night was M103 in Cassiopeia with NGCs 654, 663, and 659 in an arc below in the same field. A little after 3:00 AM it was time for another goal: tracking down the outer giants. I had looked up the finder charts for Uranus and Neptune on Sky & Telescope’s website and logged their positions in my atlas. I found Neptune first, in Aquarius, using the Apex 127. Neptune was a very blue spark, and required 257x to appear non-stellar. Uranus, farther east in Pisces, was obviously non-stellar even at 64x. I also ran up to 257x on it, but the most pleasing view was at 175x. I had seen both planets before, but never as well, nor spent as much time on them as I did last night. Very strange to see giant Neptune as a tiny point of light in the mind-boggling darkness and immensity of space. After observing planets I went back to the TS70 to continue the Messier survey. Logged M57, M56, M27, M45—absolutely stunning in the center of the field at low power—M72, M73, M2, M30, M75, M71—and old adversary from my early days with the XT6, but dead easy at low mag under dark skies—and M77. I tried for the faint face-on spiral galaxy M74 and suspected something there but couldn’t be sure. For a few these objects, including M72 and M77, I had to go up in magnification to pull them out of the skyglow or make sure they were not stars, using the 25mm (16x) and 17mm (23.5x) Plossls. I tried the 24mm ES68 but it was too heavy for the long cantilever from the mid-tube dovetail to the extended focuser tube of the TS70. 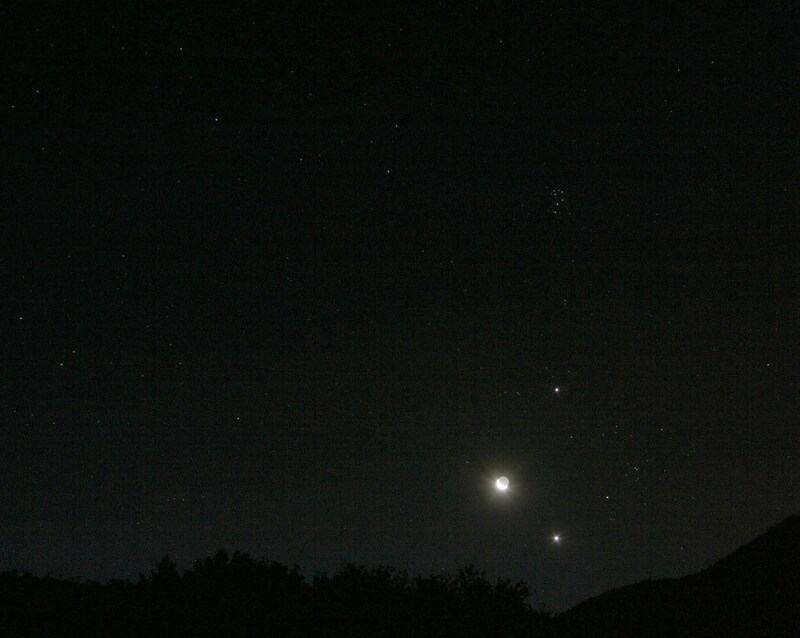 The last big show of the night was an upside-down kite shape rising in the east, with Jupiter at the top, Venus at the bottom, the thin crescent moon on the left, and Aldebaran on the right. I looked at the planets with the Apex 127 at 64x—the near-horizon seeing was bad but Venus’s crescent shape was well-defined, and Jupiter showed a couple of cloud bands and of course the four Galilean moons. Update: Pictures of this conjunction are posted here. And that was it. The sky was rapidly getting brighter in the east, so we didn’t need artificial light to pack up. We pulled out at 5:25, went to Norm’s diner for breakfast, and I dropped Terry off at his hotel and went home for some badly-needed rack. My final tally for the night was 8 new H400s, including NGCs 654 and 659; 44 Messiers, 42 of which I saw in the TS70; and 5 planets, including all four gas giants and Venus. Favorite observations were the flashing sky from over-the-horizon lightning, M81 and M82 in the same field in the Apex 127, M31 and both satellite galaxies in TS70, my best-yet views of Neptune and Uranus, and the dawn conjunction of planets, moon, and stars. Between dusk and dawn I observed five of the seven planets visible in a 5-inch scope, missing only Mars and Mercury (both were achievable, it turns out, I just didn’t try for them). It was a heck of a good night. How did all the equipment perform? Stay tuned for the next post! 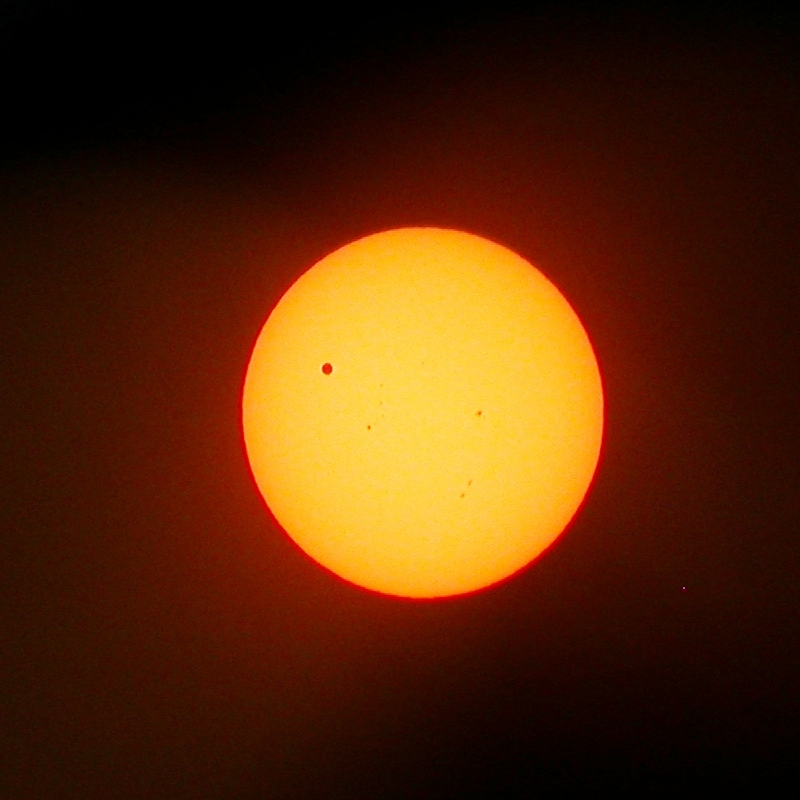 Here, just one day shy of being one month overdue, is my post on the transit of Venus on June 5. As promised, I took scopes downtown and did some sidewalk astronomy, and eventually some rooftop astronomy. 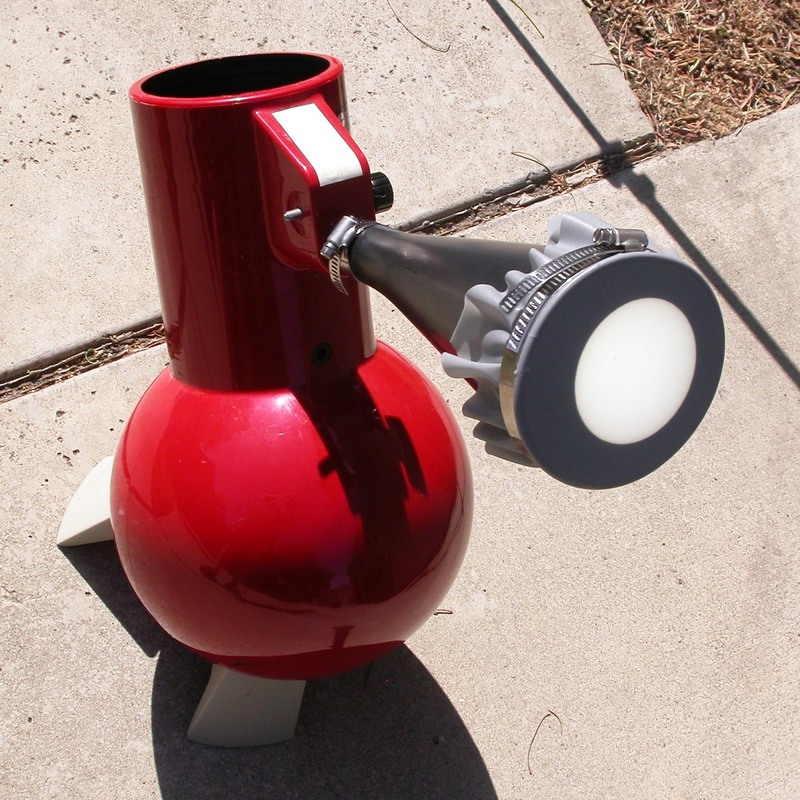 As with the solar eclipse on May 20, the primary instrument was my son’s Astroscan with a homemade sun funnel, and once again it performed beautifully. My partner in this enterprise was fellow Claremont paleontologist Matt Benoit. He was there for the whole thing, and helped keep scopes on target and help people understand what they were seeing. We hit a grocery store beforehand for soda and snacks and basically made an extended party out of the event. 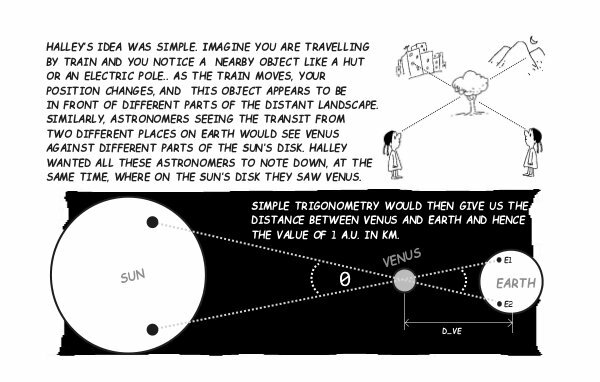 I wanted to see the transit, period, but I was especially keen to watch the entry of Venus onto the solar disk to see if I could spot the “black drop effect” that bedeviled transit-timers in previous centuries. Sure enough, as Venus started to pull away from the limb of the sun there was a persistent dark blob or zone that seemed to connect the planet to the black space beyond, like surface tension keeping a drop of water from falling off the faucet. The black drop effect was once thought to be an effect of the atmosphere of Venus, but it’s not, because airless Mercury shows the same effect during its transits (the next of which is coming up in 2016, by the way). It’s nothing to do with our visual perception, either, since it’s easily recorded photographically, as you can see above. It’s now understood to be an effect of diffraction when a vanishingly thin line of light separates two darker spaces or silhouettes. You can see it by holding your finger and thumb up to the light and bringing them together–just before they touch, the black drop effect will seem to bridge them. 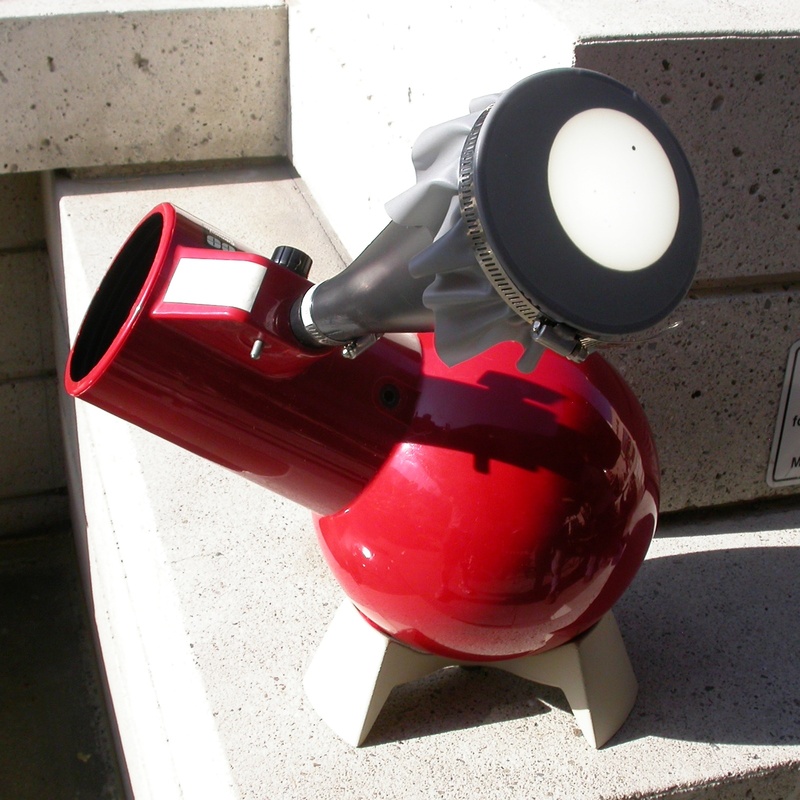 Along with the Astroscan and sun funnel, we had along the Celestron Travel Scope 70 with the aperture mask and solar filter described in this post, for direct viewing. 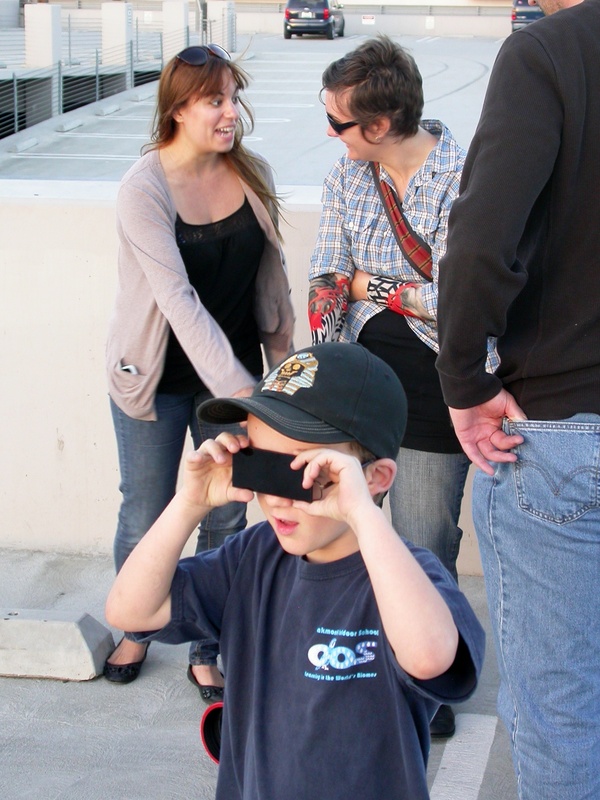 Here’s my friend Marcy, who was there with friends for about half of the transit, getting her first look. Although we both put in time on both scopes, for the most part I drove the Astroscan while Matt minded the Travel Scope. 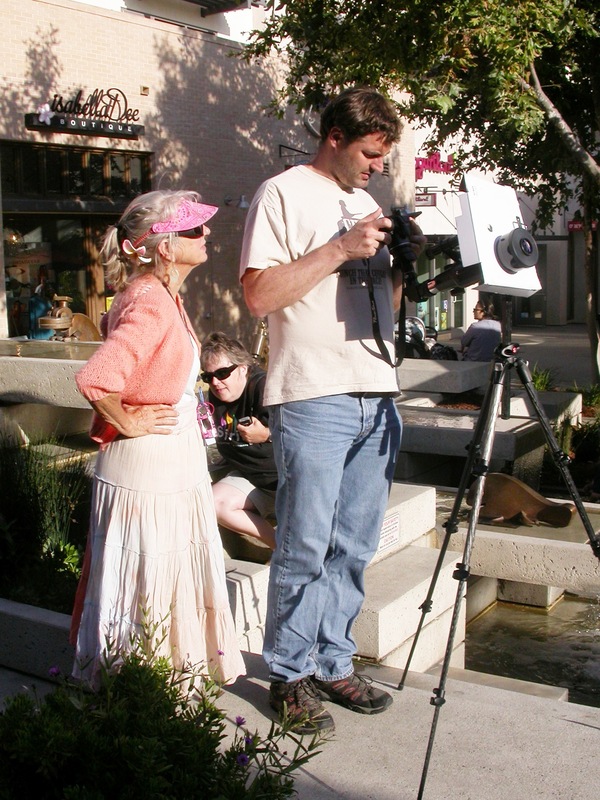 He also helped people get some photos through the eyepiece, as he did here with Marcy’s DSLR. The view through the filtered scope was not as detailed as in the sun funnel, but the warm yellow color was more aesthetically pleasing, and many of our visitors appreciated both views. Like the eclipse, the whole effect of the transit was a little unreal. In addition to the scopes, we also had eclipse glasses and a piece of welder’s glass. Every few minutes we would look up with our naked eyes and see a little black dot on the sun, and know that it was a whole world. And not just a world, but a twin of Earth. Someone on Mars watching a transit of Earth would see something very similar–our whole planet, all our evolutionary and human history, everything we’ve done or built (except for the handful of tiny things we’ve sent away)–all shrunk to a point, no larger, to the naked eye, than the period at the end of this sentence. We had a steady stream of visitors downtown until a little after 6:00, when the theater blocked the view of the sun from the public square. So we decamped to the top of the parking garage across the street. Some people followed us over from downtown, and some found us up there on their own. One guy said that he found us because he had Googled for Venus transit events in Claremont and found my morning-of invitation post, which is nice, because that’s exactly why I put it up. 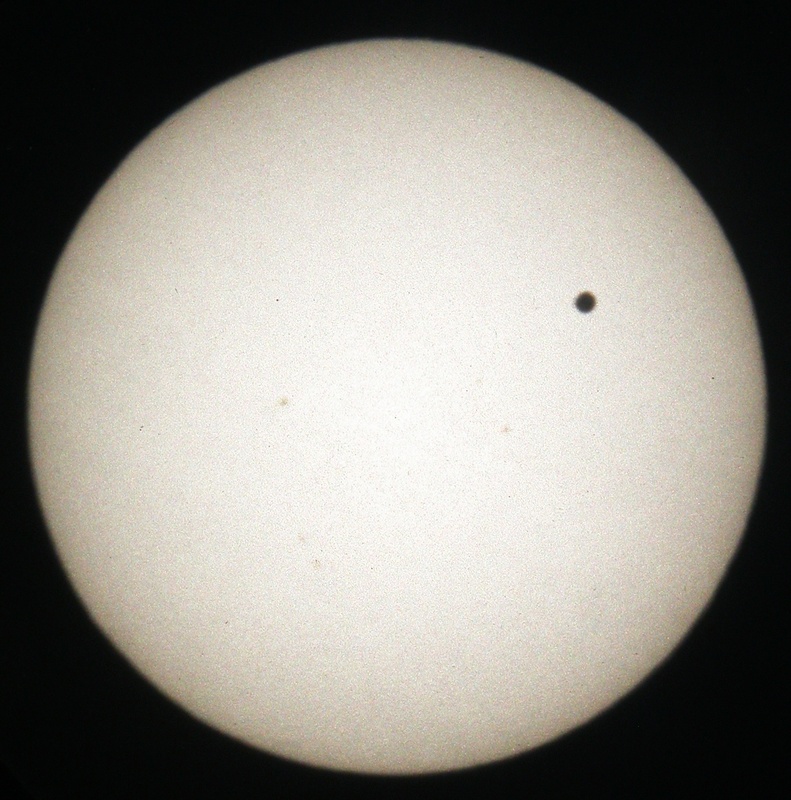 In all, about 85 people saw at least some part of the transit through one of our scopes. My son, London, watching the very tail end of the transit with the welder’s glass. Venus was still crossing the face of the sun when they set together. As with the eclipse, I managed to get a shot right when the world crossing the sun touched Earth’s horizon. 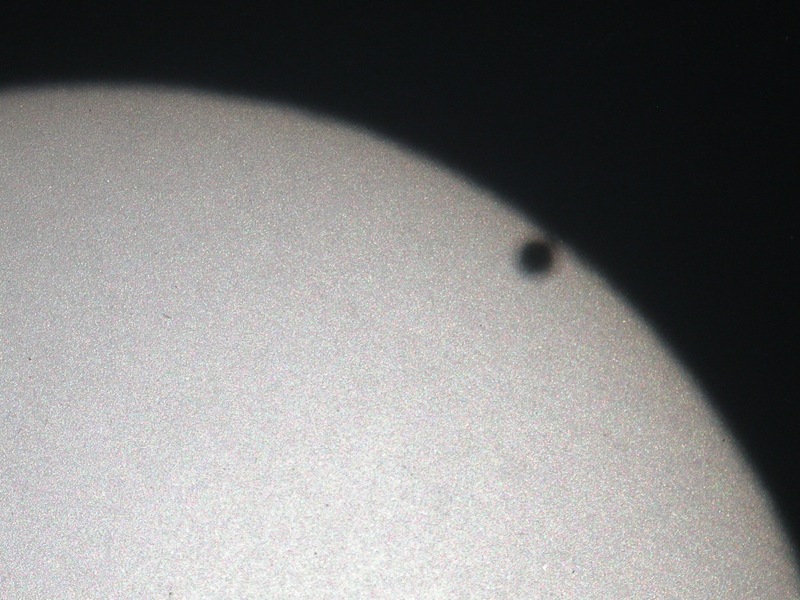 A moment later, it was gone, and the last transit of Venus until 2117 was over. I’m glad I got to see it, and to share it. I hope you had the opportunity to do the same. 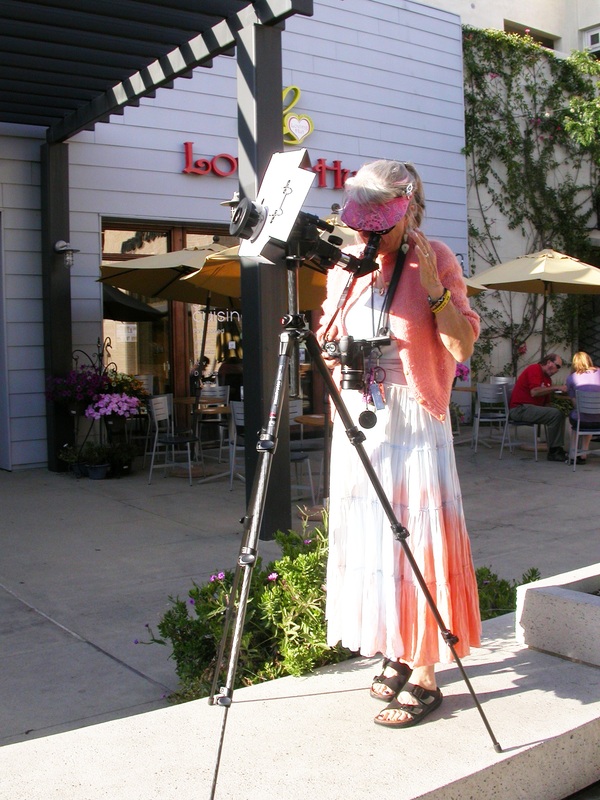 If no clouds come to spoil the fun, I will be in downtown Claremont this afternoon (Tuesday, June 5) with a scope set up for free public viewing of the transit of Venus. 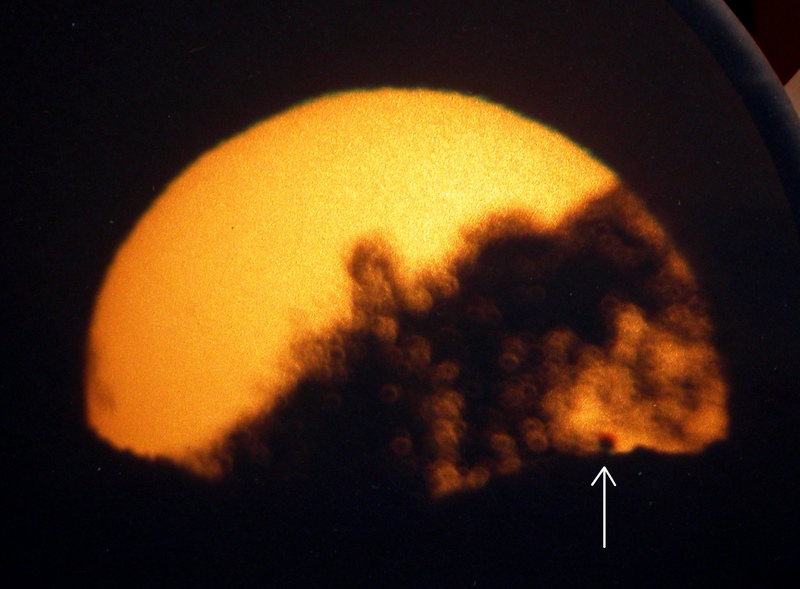 The transit starts at 3:06 PM, PDT, and will still be in progress when the sun sets at 7:59. I plan to be there for all of it. If all goes well, from about 2:50 onward I will be in the public square in front of the theater, on the northeast corner of First Street and Indian Hill Boulevard. Whenever the sun gets low enough to go behind the theater, I’ll head up to the top of the parking garage across the street, to watch the sun set with Venus still crossing the solar disk. You, whoever you are, are welcome to join me. If by some freak chance it is cloudy this afternoon, I’m going to throw my gear in the car and run up to Big Bear, which gets more sunny days than almost anywhere else in SoCal (that’s why the solar observatory is there). In which case, you’re still welcome to join me, if you can find me. Try the Discovery Center on the north shore, if it’s sunny…or the nearest pub if it’s not. Fingers firmly crossed for clear, sunny skies! 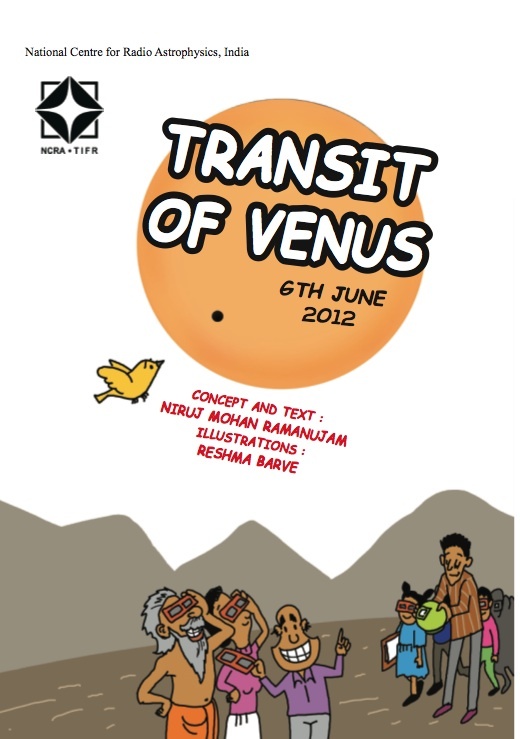 Transit of Venus comic book! I just finished reading the fine nonfiction book The Transits of Venus by William Sheehan and John Westfall, which covers all of the observed Venus transits in exhaustive detail and includes data for the unobserved (so far as we know) ones in antiquity. With most of that information still in my memory, I was impressed at how much the author and illustrator–Niruj Mohan Ramanujam and Reshma Barve–of the comic were able to cram into 16 pages (actually more like 12 if you don’t count the cover, license page, and a couple of blank pages). The book explains what transits are, why they were important historically, why they’re still important, and how, when, and where to observe the upcoming one safely. It’s free and cool, go check it out. 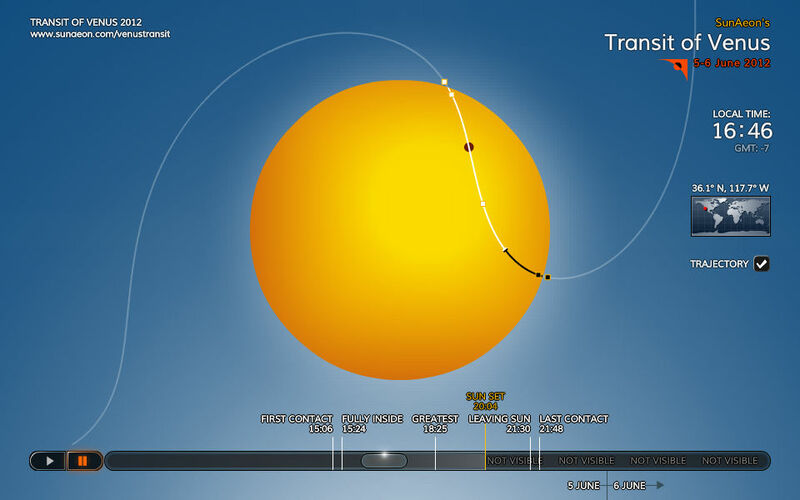 You put in your location (latitude and longitude, or click the map) and it shows you a movie of the transit from your location with contact times and places (on the limb of the sun) and sunrise or sunset if those interfere. Very slick, and takes a lot of the guesswork out of setting up for the transit. It will even spit out screenshots with a button-click, which is how I got this one. Check it out. You are currently browsing the archives for the Venus category.